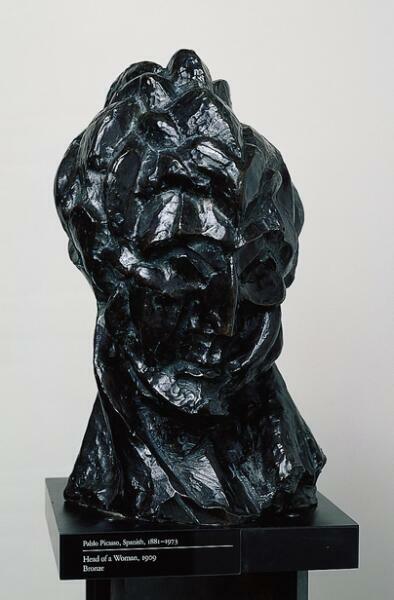 After Head of Fernande was cast in bronze (beginning in 1910, with a second edition in 1960) it was widely exhibited and published. Picasso’s fragmentation of form influenced a generation of sculptors, including Jacques Lipchitz, whose Bather III is also on view in this gallery. This faceted and fractured sculpture was done in 1909, when Picasso and his colleagues were developing Cubism. With this revolutionary style, artists worked to reveal the essence of objects by showing them from multiple viewpoints at the same time. In Cubist paintings, the flatness of the canvas is emphasized. The artist does this by destroying the illusion of space and volume, breaking three-dimensional objects into multiple planes. The planes are arranged so that we can actually see them, rather than just infer their existence. Sculpture though, by its very nature, is already three-dimensional. Translating the Cubist approach to sculpture was an enormous challenge even for Picasso, as this early Cubist work shows. The distorted features, intersecting planes, and warped shapes of Fernande Olivier – Picasso’s mistress during the early years of the century – creates the tension, contrast and energy that is very much in line with the goals of Cubism.